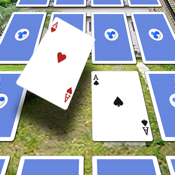 It is a nervous breakdown game of a new type that enjoys turning over the card arranged in 3D space. The rule is a nervous breakdown of usual cards. How can the card on which the space is sprinkled able to be memorized, and turned over the card?? The fighting function with the friend using the wireless makes a mistake in bursting out laughing and is none. Let's turn over there and here and memorize the card. And, do not disappoint so much due to the decrease in my memory.